This is from the MN Explorer insert in the Star Tribune today. The author is Natalia Mendez who happens to be part of the local bicycle community. It’s bike focused, but she give the perspective of someone who knows and loves the River Bottoms in it’s natural state. 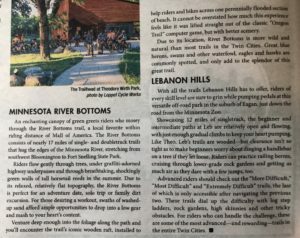 She seems to see the value that one of the last remaining truly wild spaces in the Twin Cities brings. We only wish that the folks pushing for a paved super highway through the River Bottoms shared this perspective. They have funding to complete less than two miles of the trail. To stop any further development it will take every voice who shares this perspective to speak out to those in state legislature and tell them loudly and clearly that you are a Minnesota tax payer and you do not want this fiscally and environmentally irresponsible project to proceed further. If you are a Bloomington resident reach out to your council person and tell them loudly and clearly that you are opposed to this proposed paved trail. They will likely respond that “it is a state issue”. That is a load of bunk. Tell them so. They can easily suspend support and voice their opposition to the rest of the City Council and to the state.